Betcoin are a multi-cryptocurrency gambling platform that provide a wide-range of casino games, as well as full sports betting facility. Created in 2013, they were first launched in 2013 – making them one of the original crypto-specific casinos to enter the highly lucrative online gambling industry. We hope you found our Betcoin casino review useful. In conclusion, the Betcoin platform is one of the most comprehensive in the industry. Rarely will you find a crypto-casino that offers the entire collection of software casino games, live dealers, a full sportsbook and poker tables. Moreover, the operator also has hundreds of different slot games to choose from. Although Betcoin do not hold a gambling license, this isn’t that uncommon in the crypto casino industry. They counter this by offering a provably fair protocol on their games, which is further amplified by the five year trading history. Ultimately, if you want to give Betcoin a try, why not take them up on their highly competitive welcome package? We understanding how daunting it can be to ascertain which online casino to go for, so our comprehensive Betcoin casino review is going to fill you with all the knowledge you need to know. To achieve this, we went through the complete end-to-end process of registering an account, depositing funds, testing out their games, contacting support and then finally, withdrawing coins back to our wallet. In doing so, we are able to give you an honest and impartial guide. Betcoin also offer additional deposit bonuses. You will get an extra 50% on your second deposit (up to 1 BTC) and then 25% on your third (up to 1BTC). Although this isn’t the largest welcome bonus available in the market, it sure beats anything that traditional fiat casinos can offer. Loyal players also have the chance to join the Betcoin VIP club, which comes with a plethora of awards. 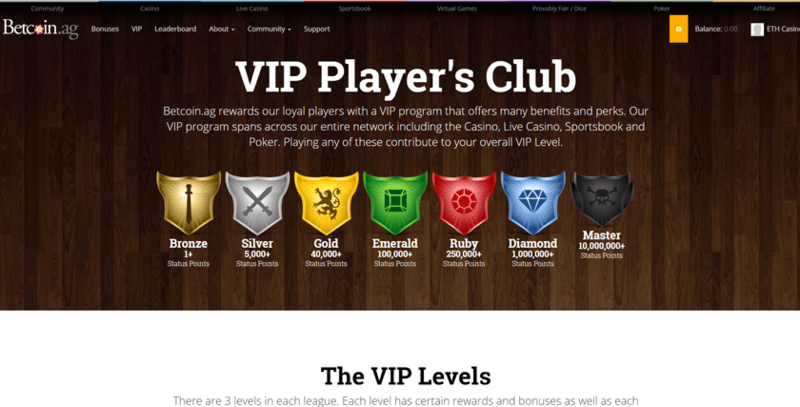 Admittance is based upon your activity levels, so the more you play, the more chance you have of becoming a VIP. If you do, benefits include cash back on loses, extra bonuses and free spins. The Betcoin platform offers a significant range of games for the player to choose from across a variety of different sections. Firstly, their casino department is filled with every traditional table game including but not limited to blackjack, roulette and baccarat. Each game is available with a twists, such as being able to choose from both American and Europe roulette. There are hundreds of individual slot games to choose from, available as either 3 or 5 reel, 3D or progressive jackpots. For those who prefer as close to the real thing in the comfort of their own, it is also possible to access live dealers on a number of classic table games, including the wheel of fortune and multi-hand blackjack. A good selection of dice games are also available, something that seems to be fan favorite in the world of cryptocurrency and blockchain technology. Impressively, there is also a complete sportsbook available, offering both pre-match and in-play odds. As one would expect for a sports betting facility the Betcoin platform covers practically every market, including the likes of Basketball, Ice Hockey, Soccer and Tennis. Upon further analysis, the odds are highly competitive, especially in the live betting section. Betcoin have left no stone unturned in their choice of games, even installing a peer-to-peer poker room, included both limit and no limit tables, as well as multi-player tournaments. All in all, we are yet to find a crypto casino that has a larger suite of games than Betcoin. Betcoin use a variety of casino software providers, who each specialize in their own skins. To make things easier for you we have listed them below. Is your favorite software developer not listed? Don’t worry, Betcoin are forming new partnerships on a regular basis, so it is worth checking back at a later date. Betcoin do not accept fiat currency deposits as they specialize exclusively in cryptocurrencies. However, this does mean that when you register an account you need to provide very little personal information. Moreover, as they have no relationship with real-world money, there is no need to upload countless amounts of documents. Instead, you will be given a unique wallet address for each of the available cryptocurrencies the platform supports and then you simply transfer funds from your personal wallet over to your Betcoin wallet. Unusually, the casino will credit your account on 0 blockchain confirmations, meaning that you can start playing straight away. Moreover, there are no deposit fees to contend with. According to the Betcoin team, when it comes to withdrawals, your first request may take up to 24 hours before it is verified, however after that the time-frame is much quicker. In fact, Betcoin state that if withdrawals are not received back in your wallet within 4 hours, then you are advised to contact the team on live chat so that they can process it manually. When Betcoin first lunched in 2013, they only accepted Bitcoin. However as they have grown, it is now possible to deposit, stake and withdraw funds in five different coins. Have a look at the support coin list below. Betcoin casino have a really bizarre policy when it comes to accepted nationalities. First and foremost, it is surprising that for a casino who offers anonymous accounts, they do not accept players from all over the world. Nevertheless, upon scrawling through their highly complex terms and conditions, we found that different games/software providers have different policies. For example, NYX (NextGen) games can be played by anyone apart from those located in Canada, and NetEnt games have a restriction of over 40 nations. To clear things up, Betcoin also state that the player must ensure that they are located in a country that does not prohibit online gambling. As of 2018, Betcoin casino do not hold a gambling license from any governmental body. Although there are a select few crypto-specific casinos that are fully regulated, in most cases this is unusual. The reason for this is the way cryptocurrencies are defined. Legislatively speaking, they do not fall within the same remit as fiat currencies, meaning that operators do not need to hold a license. In this instance, it is best to explore the trading history of the operator in question. Betcoin have been in business since 2013 and are one of the first ever cryptocurrency casinos t open their doors to the public. They have an excellent record in servicing players and online reviews are strong. To offer players an added layer of assurance, the vast majority of Betcoin games are guaranteed for their fairness by a provably fair protocol. This allows the player to independently authenticate that each and every gaming outcome has been generate randomly, in correlation to the displayed pay-out ratio. For example, if a slot game offers a house-edge of 1%, the cryptographic algorithm that generates the spin can confirm that this is indeed the case. Provably fair cannot be overridden or tampered with, which guarantees the game can be trusted for its fairness. Betcoin have an excellent customer support platform, which includes a live chat facility that is available 24 hours a day, 7 days a week. We know that talk can sometimes be cheap, so we decided to test it out for ourselves. In all instances, we were never kept waiting for more than 60 seconds, which we thought was highly impressive. Moreover, each request was resolved without issue. Failing that, players can also send an email to the support team. We received a reply within the hour, although if you require instance support, it is better to contact the team via live chat. Although we found a post by Betcoin in 2015 explaining that phone support was on its way, it appears to still be in the pipeline. However in reality, due to the nature of their international client base, such a service might not be feasible.